Yann Arthus-Bertrand is rightfully a legend. A filmmaker since the 1960s and one of the most prolific aerial photographers on the planet, he has become a pioneer of using sky-high photography to raise awareness of environmental issues, through his work for the United Nations as well as collaborations with National Geographic, Life and other important publications. His book ‘The Earth from Above’ has sold more than four million copies worldwide. Now he is the first DJI Master, an ambassador and partner of one of the world’s leading commercial drone brands. The partnership is significant in other ways too, as this marks the first time the experienced aerial photographer has started using drones for his work, as he previously had been a stickler for helicopters and hot air balloons. Indeed, DJI told Digital Camera World that when Yann first tried flying a drone three years ago, he crashed it, and dismissed it as more of a gadget than a serious filmmaking tool. The DJI team had more luck introducing him to the technology this time around. In a video accompanying the news, DJI paid a visit to Yann on the set of his new film ‘Woman’, for which he is shooting with the DJI Inspire 2 drone and Zenmuse X7, the firm’s Super 35 cinema camera. You can watch the behind-the-scenes footage here. It’s interesting watching the BTS footage and seeing how the drone setup complements Yann’s style of filmmaking -- he describes himself as a director who works ‘spontaneously’, and the flexible drone setup seems to really add to his versatility and ability to improvise. Yann is the first inductee into the DJI Masters programme – Chilean cinematographer Claudio Miranda and New Zealand director Rodney Charters will also be featured, with videos to be released at a later date. 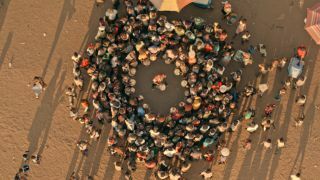 Yann Arthus-Bertrand’s film ‘Woman’ will be released in 2019 – find out more here.